Mahahual is a village on the Costa Maya in the municipality of Othon P. Blanco on the Caribbean Sea coast of the state of Quintana Roo, Mexico, a short distance northeast of Belize. Previously a fishing village, it is now a rapidly developing tourist center. The village of Mahahual is only about 3 kilometers (1.9 mi) away from the Costa Maya cruise port, and cruise ships can easily be seen from the village. Mahahual has soft sand beaches, grass thatched palapas, and the Mesoamerican Barrier Reef that runs along the coast. Many hotels, bars, restaurants, and shops can be found in this quaint tourist town. In 2010, Mahahual had a population of 920. 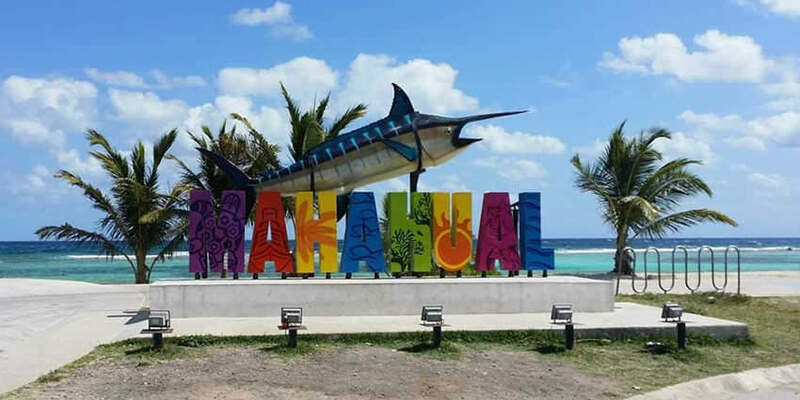 Mahahual is to become a larger tourist center with an airport and a large dock for cruise ships. A new development called New Mahahual is being created directly inland from the port. When ships are in port, the village is busy with cruise passengers. Mahahual used to be a quiet and friendly small fishing town off the beaten track. However a large cruise ship docking jetty dubbed “Puerto Costa Maya” has been constructed just up the beach. Every day a couple of cruise ships dock and the occupants are disgorged onto the town to drink, shop, swim and ride jet skis and quad bikes. However the further south away from the cruise ship dock you go the quieter the town becomes, so it’s still possible to have a quiet time of it, especially at some of the hotels south of town. In August 2007, Hurricane Dean landed just north of Mahahual. It heavily damaged the cruise ship dock and destroyed much of the small village. The village was rebuilt, cruise ships returned, and many nice hotels openrf. A new seaside Malecon runs from the main road to the southern end of Mahahual Pueblo. The Malecon is a pedestrian walkway with the beach to the east and businesses to the west. Many nice restaurants and shops line the Malecon. If you are looking for quiet tranquil beaches, away from the crowds, drive through Mahahual and continue 4 kilometers along the coastal road. After passing the small bridge of Rio Bermejo (hardly a river, more a small stream connecting the mangrove waters with the ocean) you will find small ecological hotels, restaurants and rental houses, all beachfront. Electricity is generated with solar panels, wind mills and most of the businesses use a generator as a back up. Rain water is captured on roof decks and collected in systerns used tio shower and flushing toilets. When you arrive at km 12, there is a turn off to the right, take it to either return to Mahahual or continue to Xcalak. If you continue on the beach road, you will find lots of empty bays,only a few rental houses on the road side.